Custom Organic Cotton Prints. Organic Cotton Printed Fabric. A rustic, natural half panama, made from 100% certified organic cotton. This printable heavyweight fabric is woven in a half-panama weave with 1 weft thread for every 2 warps, with no elasticity. An organic cotton printing fabric is an unbleached fabric, lighter than classic panama fabric, with flecks of cotton seeds embedded within. 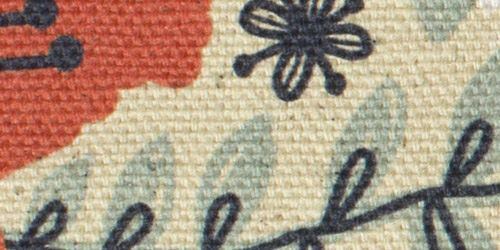 A charming fabric, to excite vintage lovers and rustic makers alike. 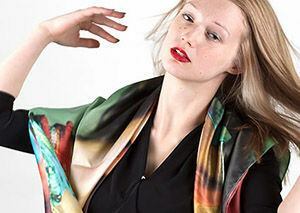 This custom printed fabric is opaque and is soft to the touch. Our Organic Half-Panama Cotton is a member of our organic cotton printing fabric family. 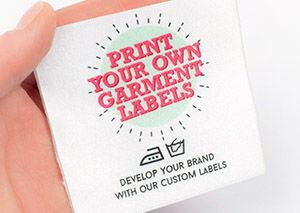 We print on a variety of eco-friendly fabrics perfect for the environmentally minded. We simply love the rustic texture of our Organic Half-Panama Cotton. Soft to the touch but with a distinct woven handle, this organic cotton has a somewhat solid drape. The basket weave looks and feels totally authentic and makes it a breathable fabric. The texture on the face is the same as the back, with a lovely, natural appearance. Our custom printed Organic Half-Panama Cotton has a rustic, off-white stone base color, which is wonderfully natural. The organic nature of this cotton fabric makes it a joy for showcasing vintage inspired prints. Colors will appear somewhat muted and brighter hues are toned down and darkened somewhat. The natural black flecks of the cotton husks and seeds show through this panama fabric. They will be more prominent through lighter colors, whereas with black, they are not visible. 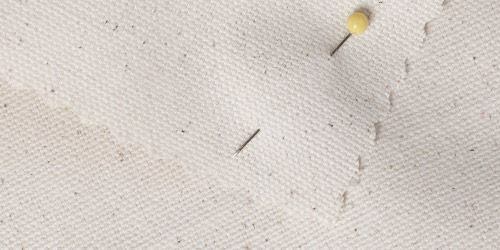 This organic fabric will really excite vintage lovers, rustic makers and the environmentally minded. 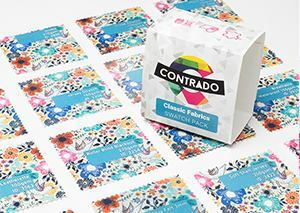 The heavyweight nature of this custom printed fabric, along with its relatively soft handle, makes it ideal for craft projects, tote bags, cushions, roman blinds and some upholstery and soft furnishings. If you are wondering how to make a bag and which fabric would be the best option, then give our Organic Half-Panama Cotton a try! Amazing gift idea! The quality was just what you'd expect and it got to me very quickly. I printer a large map on the fabric of my choice and I plan to frame and hang it. I was worried about the image being distorted but the design program allowed me to adjust the sizes and customize everything. When I got it in the mail I was so excited and its absolutely perfect! Met Expectations We received our prints - really great service. Our prints came out as my uploaded picture. Our experience with Contrado has been exceptional for our needs. What makes this a half panama instead of a classic panama? Both are woven fabrics in a hopsack weave structure and essentially, the main difference between this and the classic panama fabric, is that the half is a lighter fabric. Both organic cotton textiles have a beautiful, uniform weave and a solid structure, but the Organic Half-Panama Cotton is generally much lighter. What does this fabric look like? We have a real soft spot for this panama fabric, as it is filled with character. Due to its organic nature, our half panama has a totally natural hue and finish. A warm off-white, almost stone base tone absorbs color, while giving prints a vintage inspired, slightly faded appearance. 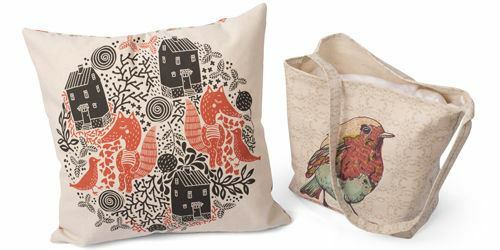 Featuring flecks of real cotton husks and seeds, we guarantee you will love printing on organic cotton as much as we do! Does Organic Half-Panama Cotton stretch easily? Due to its tight and solid basket weave, this cotton fabric has not been designed to be able to stretch well. There is very minor give on the bias. Due to this slightly more constricted nature, we would only recommend using this organic cotton for bags, cushions, roman blinds, tote bags and other soft furnishings and upholstery. 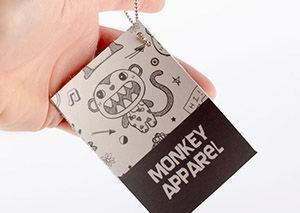 It could be used for outerwear such as jackets.